The City’s Contractor, Ghilotti Bros, installed new concrete medians on the north and south legs of Las Gallinas. A portion of the median on the south leg (i.e., the Safeway side) remains to be constructed at a later point in time thus allowing buses and large trucks to turn right from eastbound Freitas. The subcontractor, Valentine Corporation, demolished the existing bridge deck on the west side of Las Gallinas. This work has taken longer than expected as the Contractor encountered unforeseen buried concrete and old street light foundations, which likely date back several decades. The electrician installed underground pipes as well as poured the foundations for cabinets that will house new traffic signal equipment. Additionally, the electrician excavated and poured the foundation for one traffic signal pole. The City and Contractor have completed coordination with AT&T while AT&T’s contractors relocated their communication lines away from the City’s new bridge deck spanning the drainage ditch. On August 7th, the City modified the traffic signal timing, again, splitting the operations of northbound and southbound traffic on Las Gallinas. The purpose of this change was to increase safety for vehicles passing through the intersection adjacent to the Contractor’s large, heavy equipment used for drilling 30 foot deep foundations for the new bridge. We anticipate this signal operation change to be in place for a few weeks while the Contractor drills new foundations on both the west and east sides of Las Gallinas. Attached are two photos showing the installation of a rebar cage and concrete for the bridge foundations. The electrician will drill and install concrete foundations for the new traffic signal poles. This work should last approximately one week. 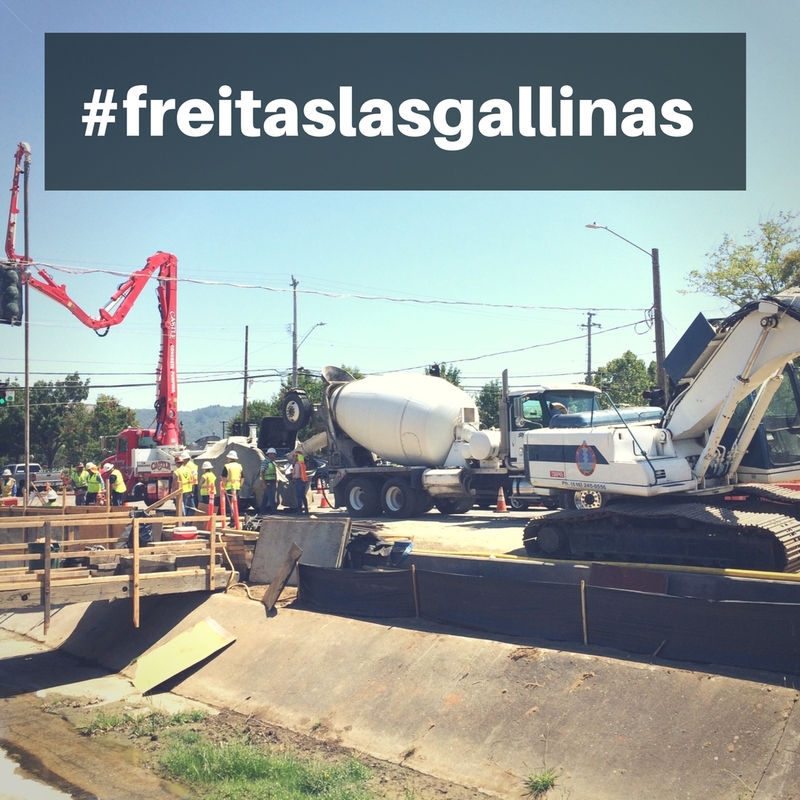 Other work includes the installation of concrete foundations for the bridge on the west side of Las Gallinas. We anticipate this work taking about one week as well since there are a total of eight foundations reaching 30 feet deep. Once the foundations are complete and have cured, the Contractor will begin to install a concrete abutment, which is the concrete holding up the pre-cast bridge slabs. Between the foundations and abutment, we anticipate the bridge work on the west side of Las Gallinas to last for a few more weeks. Once all work is complete, the Contractor will shift over to the east side of Las Gallinas. With the west bridge deck being closed, the City would like to highlight the relocation of the crosswalk crossing Freitas, which is now located on the east side of the intersection. Please follow all construction signage, as well as the traffic signal indications, to safely cross all streets. Please also note that the City has extended the time period in which the Contractor can close travel lanes. Lane closures may now occur between 7:30 AM and 4:00 PM. This will allow the Contractor to complete more work during the summer weeks before school is in session. The City appreciates your patience during construction and request that you allow for additional time to travel through this busy location. If and when possible, please consider taking alternate routes to avoid this intersection, especially during commute times.